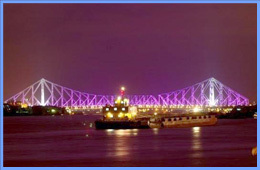 Kolkata is popularly known as the 'City of Joy'. The city is famous for its warm-hearted people, the colorful festivities, the magnificent river Ganga, and the Bengali sweets among other things. There are many tourist attractions in Kolkata including Victoria Memorial, Howrah Bridge, museums, science city and so on. Bengali's are very fond of sweets. Sandesh, rosogolla, chanar payesh and Misti doi are some mouth- watering sweets found especially in Kolkata. Amongst the Bengali cuisine, the famous Macher Jhol (fish curry) and rice is not to be missed. Tour itineraries to Kolkata include package many lucrative deals to tourists coming from all over the world. The reasonable rate of the tours is the main attraction for tourists. The various tours come at a very low price, which can be afforded even by the budget travelers. Most of the tours cover the main attractions within the city and some of the important nearby destinations. Tour operator's spread all over India and abroad offer great itineraries for Kolkata. These itineraries can be for a short duration as well as long one's as per your convenience. Most tour operators offer as short as 3 days to even a month long tour to Kolkata covering most of the interesting destinations in West Bengal including hill stations like Darjeeling and Sikkim. India Profile offers online booking of Tour itineraries for Kolkata.